On Sunday afternoon at SeaTac Airport, I stood in line to board a rickety little plane half-full of writers bound for Los Angeles. It was all too easy to spot them: they had purple-stamped canvas bags slung over their shoulders. They were slowly thumbing expired editions of Tin House and trying to cram conference materials into over-stuffed carry-ons. They were silent and pallid and greasy. Earbuds were stuck in their ears. They shared the countenance of a bunch of introverts, well over capacity. 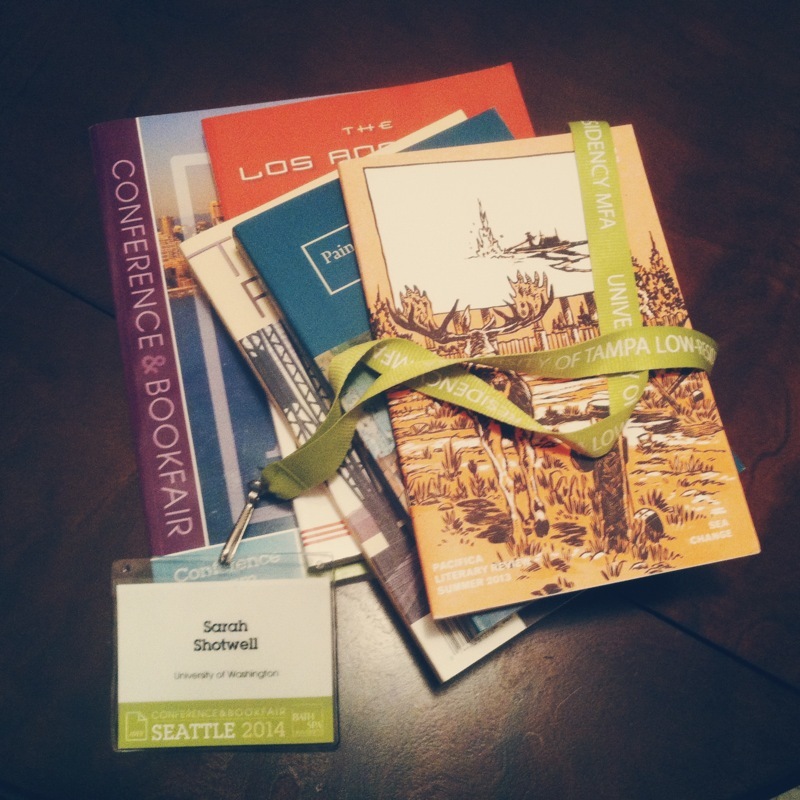 The 2014 Association of Writers & Writing Programs Conference, hosted by the University of Washington Creative Writing Program, drew more than 10,000 outsiders to Seattle last weekend. Since 1972, AWP has pulled its unwieldy community of writers, publishers, teachers and readers together under one roof for a long weekend of paneling, browsing, networking, reading, and partying. The conference also is the host to the largest book fair in North America, where MFA programs attempt to draw applicants, and where publishers and foundations come to hawk subscriptions, promote contests, and sell titles at a discount. Like most of my friends, I experienced AWP for the first time ever this year, and like my comrades at the airport, I had a lot to process on my way home. As I edged away from all these spent-up literary people, trying to give them space, it occurred to me that in many cases, writers aren’t built for this sort of thing. We don’t normally thrive in huge crowds, nor do we usually have the energy for overstimulating, cavernous corporate spaces. And yet year after year, writers flock to AWP in hopeful droves. Before AWP, I’d been to my fair share of conferences. The last was for college activities. It was held in Southern California, and brought together bands, singer-songwriters, motivational speakers, magicians, comedians, and alcohol awareness skit-actors, all participants (and geography) well-suited and accustomed to cheerful self-promotion. Most were extremely adept at it. The talent fair was full of seasoned marketing experts who knew their audiences. Their booths had giveaways: tea, records, glow sticks, candy, had special effects and magic tricks and dirty jokes. More importantly, the objectives were clear: in the fair there were marketers, agents, and performers selling talent, and in the crowd were buyers there to book that talent. There were, of course, those who were just there to learn and take it all in, but these, for the most part, stayed out of the way of efficient commerce. AWP was a totally different situation. On the first day, when I entered the book fair packed with almost seven hundred tables piled high with magazines and books and pamphlets, my curiosity quickly dissolved into mild panic. It was huge, overwhelming, and overstimulating, as trade shows often are. But unlike the others I’d been to, I had no idea what I was supposed to do in there. I had no plan on how to approach a table, no clue what questions to ask. That first time in, I paced down one busy row, turned up another, and headed straight out the door for a cup of coffee. Part of what burdened me upon entering the book fair was that the hundreds of publishers and MFA advertisements and indie zines and book arts designers each had a unique objective. I didn’t have a clear map of where to go or what to talk about with any of them. But all of it also smacked me over the head unexpectedly with the reminder that the literary scene in America is not just a community; it’s an industry. A massive one. For a young, small-town writer adrift out here on the West Coast, it can be easy to forget that. Seeing just how big the writing world is put me on edge. I’ve been comfortable until now existing in my own little sunny, writerly microclimate – in my stories, among my MFA buddies, in my blog, my emails with the occasional “real” writer, in my classroom with my students. But when it came to big writing and publishing and imprints and journals and publicists and awards and keynote speakers and editors and the thousands upon thousands of aspiring writers trying to navigate that universe, I had no idea how to compose myself. AWP dragged an insecurity out of me this year: the fear that I’ll never be good enough to succeed, that I am just another one of the 14,000 writers who came to Seattle this weekend with too high of expectations. That there couldn’t possibly be enough room, enough readers, enough space in the pages for all of us. But as the weekend barreled on and I wobbled, dazed, through the book fair, AWP slowly unfolded its point to me. There were hundreds of panel discussions, all different in topic, dozens of readings, and half a thousand presenters offering up opportunities to read and publish and teach and study. From Amazon with their roll out of the Kindle Worlds platform, to the Fairy Tale Review, to Quarter After Eight (publisher of micro nonfiction) to a journal entirely devoted to the retelling of Aesop’s Fables, to the travel and food writing advocates, to the non-profits like Writers in the Schools and Hedgebrook, to the little design-forward chapbook publisher who released a collection flash-fiction told entirely through the perspective of David Bowie, this is a crazy, varied publishing world, and somehow there seems to be just enough room for all of us in it. There is a place for every genre – for every passion – whether it’s essay translation, epic poetry, or Raymond Carver fan fiction. There are audiences for each of us to engage with, and journals for us to submit to. We are writing to a world that is open to new possibilities, and to many, many voices. AWP, I finally realized, is an invitation for all of us to meet up and celebrate that fact. Happy to be left alone by my fellow writers, I traveled home from Seattle last weekend exhausted, shipwrecked, and totally smiling (with my nose stuck in the newest issue of Zyzzyva, of course). It was an overwhelming, insane, uncharacteristic weekend, and I’ll be back next year, notebook in hand, ranging from booth to booth, eager to learn all I can.